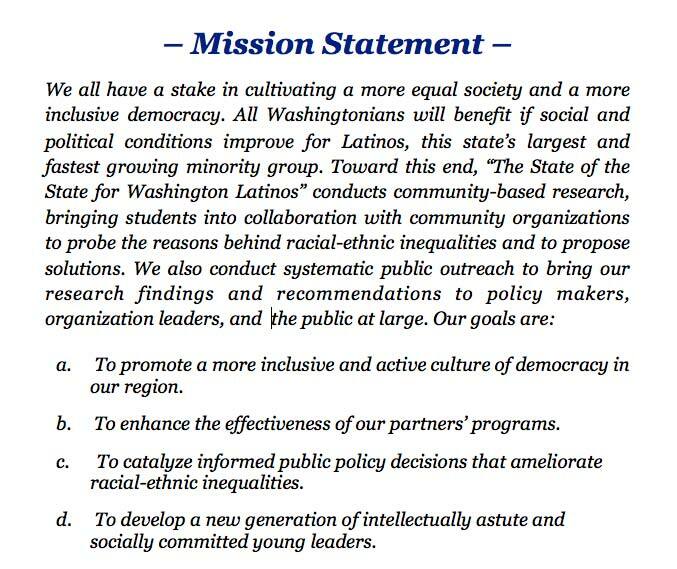 The State of the State for Washington Latinos is an ongoing program at Whitman College in Community-Based Research. Doing “community-based” research (CBR) means that each student collaborates with a community partner whose professional work centrally involves the Latino community. For example, we have partnered three times with Commitment to Community, a neighborhood-based organization seeking to improve civic engagement and neighborhood public resources in Walla Walla. Our other partners this year are the Seattle-based immigrant integration organization OneAmerica (which has a chapter in Walla Walla), the Walla Walla Public Schools bilingual program, and the National Voting Rights Advocacy Initiative at Seattle University’s Law School. The signature innovation in this project has been our ambitious and systematic program of public outreach. We exercise special leadership in this area with the national network of colleges and universities participating in community-based research and civic engagement activities. Our State of the State students and partners take the research to policy makers, media representatives, organization leaders, and ordinary community residents. These outreach activities seek to enhance the culture of democracy and to catalyze public policies that promote social and political equality. Making these ventures succeed means methodically equipping students with the skills they need to communicate effectively and to elicit active responses in a diverse set of venues, whether in the chambers of state legislators, at a gathering for immigrant families at a pizza restaurant, in the studio at a community radio station, or on stage in front of an audience of hundreds. They need to learn how to speak confidently in languages other than English, how to “read” the particular needs of specific audiences and make on-the-spot adjustments, how to work as a team, how to integrate visual and oral appeals, and how to interact spontaneously with their listeners in ways that both educate and motivate. The idea is that the student’s research meets a real, practical need of the partner’s organization – it gives them new knowledge and better equips them to do the work they do. That might mean getting more city support for a neighborhood improvement project here in Walla Walla. Or it might mean helping a non-partisan group figure out the best ways to register more Latinos to vote and turn them out on Election Day. But we also have a greater ambition: to spur public, democratic debate about the challenges Latinos face in this state, and to get government officials, other leaders, and the public to take these issues seriously and work on solving some persistent problems. And so, for instance, our state legislators from here in the 16th District say that they really rely on the work of Whitman students for accurate information and sound analysis of health issues facing Latinos. Or there’s the case of Sunnyside, where the city council switched from at-large to district elections after a Whitman researcher found that the at-large system was unfair: it made it virtually impossible for Latinos to elect one of their own, and probably discouraged Latinos from even coming to the polls.